We are now down to the last 3 boy themed parties. Year 7 and year 8, were two of our very favorite. When he was 7, Kyle wanted to have a safari party. See the monkey in the picture. It has actually come in handy at 4 parties. Who would have thought it when I bought it. Mr monkey has been present at 2 luaus, a zoo party and a safari. For our keepsake from this party, I hung a Safari Sign Up sheet for all the kids to sign. The pictures were taken on a trip to the zoo that you might see in an actual safari. Kyle had so much fun leading his friends on a safari through the house and backyard. I loved this picture because off all the kids in hats..
Having 3 kids with a ton of stuffed animals helped to set up the safari. Above is where the tigers live. The lions and an elephant were found outside. We carried circus peanuts on spoons at the end of the course to feed the baby elephant. Decorations were vines that were both store bought and homemade. To make vines, use brown kraft paper and attach yarn and leaves. He requested a cake that looked like a real banana. I remember thinking, how in the world am I going to make that. I ended up baking the cake in a long, skinny Wilton pan and frosting it yellow. I then added yellow fondant for the peel. He loved it. I asked Kyle recently which was his favorite party of all, and he answered his Pokemon party. He has always loved Pokemon since he was real little. The year he asked for a Pokemon party there was no party supplies to be found. I had to make up everything my own. The color scheme was red, yellow and blue. The cake was easy to make. I used 2 cake mixes in a giant circle pan, and then used red and white frosting. That year each of the guests posed with a Pokemon, or Pokeball wearing a hat bought from Oriental Trading company. I had Kyle chose 20 of his favorite Pokemon. I then gave a lesson on each of the characters he had chosen. We then played Pass the Pokeball. I had to make them from clear plastic ornaments painted white and red. When the music stopped and you were holding a Pokeball, there was a printable picture of a Pokemon inside. Once everyone had a Pokeball, it was time to "Find Them All". All around the backyard, each child had to find 3 more printables matching the Pokemon in their Pokeball. We don't always do a pinata, but that year we did. We had some trouble breaking it though. Kyle ended up having to put his stick through the 8 and pull. To be fair the smaller kids got a headstart. I also had extra candy on hand so everyone had a good amount of candy. I am a little disappointed that I cant find many pictures from his 9th birthday. That year he came up with his most difficult theme. He wanted a "Honey, I Shrank the Kids" type party but he refused to call it that. He wanted all the props and food to be really big. The husband of a friend of mine is a blinds distributor, and he gave me several long skinny boxes. At this party the kids posted with the giant toothbrush. It is not the best picture, but at the front door the guests were greeted by a giant dragonfly. I can't find my inside pics at the moment, but I hung green streamers all over the house to feel like we were really small and lost in the grass. 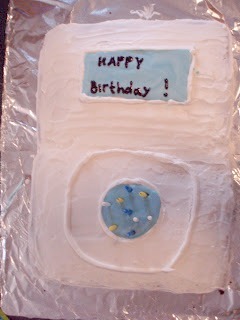 I made a large sheet cake and made it look like an old school Ipod. Wow have they changed since then. The food was all big. Here I made one pizza in the shape of a giant slice. I really hope I can find the rest of my pictures from this party. One thing fun about this kind of party is you can easily use your imagination when thinking of "big" items. I hope you enjoyed this trip down memory lane and find there are some ideas you can use. If you missed years 1-3, you can see them here. Years 4-6 can be found here. I will be linking my party ideas up on these amazing blogs here. Be sure to give them a look. Your son sounds really funny to me. How in the world did he come up with that last theme? So funny! Fun! I need all the ideas I can get for my twin boys' bdays! Thanks for linking to our Handmade Tuesdays party. These are all such adorable themes! My boys would just love the Pokemon party! Thanks so much for sharing with the Pink Hippo.. can't wait to see what you share next! Such cute ideas! Thanks so much for sharing them with us this week! Thanks for the ideas! My son wants a Pokemon party this year, and you have some great ideas!! !